Compared to 20th-century Ypsilanti newspapers, our community coverage will inevitably be reduced – to a level that could fairly be regarded as a homeopathic dilution. We Ypsilantians are losing our last nominally-local newspaper. Screenshot of March 26, 2014 note to readers from publisher Jim O’Rourke announcing the changes at Heritage. Image links to the article. 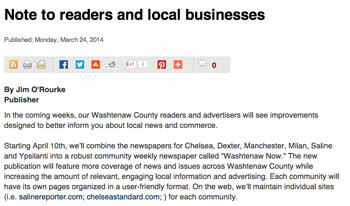 As of April 10, the Ypsilanti Courier, which currently maintains its office in Saline, will be amalgamated with the Chelsea Standard, Dexter Leader, Manchester Enterprise, Milan News-Leader, and Saline Reporter to form a media entity called Washtenaw Now. The weekly Ypsilanti Courier usually runs around 24 pages, according to its advertising department. Though it will combine six similar local newspapers, the weekly Washtenaw Now likely won’t contain 144 pages; by comparison, 120 pages made up last Sunday’s New York Times. Compared to 20th-century Ypsilanti newspapers, our community coverage will inevitably be reduced – to a level that could fairly be regarded as a homeopathic dilution. The University of Michigan used to have a homeopathic college. It closed. Aside from a possible placebo effect, homeopathy doesn’t work. But in the early 1930s, the full-strength Ypsilanti Daily Press provided a powerful remedy to ailing residents. It galvanized Ypsilantians to join a massive two-pronged community project that united clubwomen, farmers, the destitute, church ladies, storekeepers, city officials, and myriad other community members. Because of the paper’s intervention and leadership, hungry Ypsilanti children ate nutritious food the following winter. 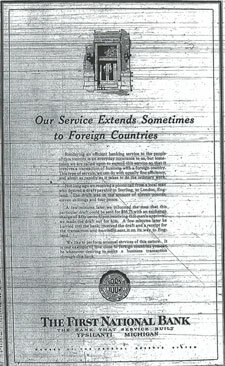 Ypsilanti’s First National Bank took out a triumphant quarter-page ad when they processed a single transaction with an exotic ‘foreign country’. June 9, 1931 Ypsilanti Daily Press. As the Depression deepened in Ypsilanti, limited resources existed for the poor or unemployed. There was no federal unemployment insurance, Social Security, or food stamp program. In the spring of 1931, a year and a half after the stock market crash, President Roosevelt’s New Deal programs did not yet exist to help out-of-work Ypsilantians. In addition, just a few years earlier, the majority of Americans lived in rural areas. Even such urban areas as Ypsilanti remained insular. Because of these conditions, relief for the poor had long been locally organized. Commissioner of the Poor was a long-standing city job; in the early 1930s it was held by Ralph Southard, who was also police chief. When the Depression created privation, the city drew on this local tradition. Led by the Ypsilanti Daily Press, the city of 10,300 devised its own solution. “Social Service Worker, Daily Press, Sponsor Home Gardens,” read an April 1, 1931 headline in the Ypsilanti Daily Press. Municipal social worker Inez Graves and the paper asked property owners to allow disadvantaged neighbors to create vegetable gardens on vacant property. Residents could call the paper or drop in to its downtown office at North Huron and Pearl, opposite the now-Riverside Arts Center, to register their open land. Graves was in charge of matching needy families to available lots, wrote the Press. It was one of many roles Graves would assume for the Home Gardens project. Residents responded immediately, noted the Press. Lots near Recreation Park, another on Davis Street, and one near Ecorse Road were immediately donated, with 124 additional lots to follow including one three-acre swath. Lots were not requireed to be within city limits, said the paper, as Graves would assign more distant lots to families with some means of transportation. Between 40 and 50 gardens were soon under cultivation, according to the June 3 Press, with gardeners guided by advice from Ypsilanti High School agricultural instructor Charles Osgood. Residents without property to lend could help in other ways. Some gave money. A local greenhouse donated cabbage and tomato plants. Ypsilantians were also asked to donate any extra vegetable seeds. For some Ypsilanti families in poverty, like those who kept children home from school for lack of adequate clothes to wear, there was no money for a packet of seeds. Despite donors’ generosity, a few lots remained unclaimed. The June 4 Press advised, “People who called upon the city for help during the winter, but who failed to help themselves during the summer, can scarcely expect sympathetic consideration if next winter they again find themselves without food.” Many, however, took advantage of the chance to grow fresh food. In September, the second part of the city’s effort to feed hungry residents began. Residents and local farmers were asked to bring surplus vegetables and fruits to the Board of Commerce offices at Michigan Avenue and Adams street throughout September and early October. The bushels of tomatoes, potatoes, beets, carrots, peaches, and apples collected there would be redistributed by a dedicated city truck to local groups for numerous canning sessions. The Press asked local churches and clubs to help with this massive canning venture by scheduling one canning bee each. The Press asked the public to contribute any canning jars, canning lids, sealing paraffin, sugar, salt, or money to the effort. The paper asked each participant to bring her own paring knife, at least a pound of sugar, and as many Mason jars as she could donate. The Baptist Church led the endeavor with a squadron of women canning for four hours in the church’s kitchen on a mid-September Saturday afternoon. Peaches, plums, pears and tomatoes were canned, according to the Sept. 19 Press. Capping off 156 finished quarts of canned food, the energetic Baptist ladies volunteered to do an additional bee. The local Lutheran, Methodist, Presbyterian, Catholic and Congregational churches held their own canning bees, as did the Daughters of Veterans, Order of the Eastern Star, other clubs, and a group of teachers in the high school kitchens. “Every Day a Canning Day for Ypsilanti This Week,” read a Sept. 22 Press headline. One of many donors, the Kiwanis gave $25 [$380 in 2014 dollars] to the effort. Boy Scouts joined members of the Women’s Study Club on drives into the country to ask for additional donations of surplus vegetables and fruit, which, said the paper, were gladly given. The entire community contributed to the titanic effort, as the Press continued to publish appeals for donations and thanks to participants and donors. It is interesting to note the apparent ubiquity of canning skills. During the Depression, Ypsilanti piano dealers the Grinnell Bros. branched out into ammonia refrigerators. The units were expensive and could be bought on time. Presumably the preservation process was second nature to many women. Home refrigeration beyond the small, primitive icebox was an emerging technology in the early 1930s. 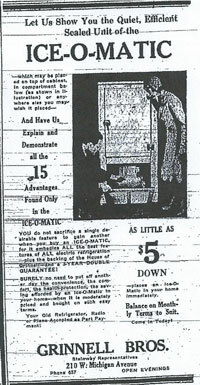 The Press carried numerous ads for home refrigeration units in the summer of 1931. The majority of units operated not with the familiar electric compressor but with a small fuel burner. These were absorption refrigerators, the kind still found in RVs. Unlike modern compressor refrigerators, absorption refrigerators use a nonmechanical thermochemical closed-loop system that exploits the evaporation of ammonia to draw heat from the food chamber. The system is quiet with no moving parts. As it requires no electricity, it was marketed to rural residents. Rural electrification had yet to arrive to much of Washtenaw County. However, absorption fridges are less efficient than compressor types. In terms of home refrigeration, fuel-powered fridges were a short-lived transitional technology. At the end of the city canning bees, the finished jars of food were collected from sites throughout town and transported to City Hall, then located in the former Quirk mansion at 304 (now 300) North Huron. Special shelves were built to hold the winter treasure, sorted by type of food. Ypsilantians had turned their hallowed hall of governance into a giant pantry. The final tally was 2,080 quarts of canned food. A quart Mason jar with lid is 6 and a half inches tall. If laid end to end, the colossal production of the citywide canning effort would have extended for the better part of a quarter mile – and far into the coming winter for neighbors in need. The success came thanks to the efforts of the invaluable, now-vanished onetime local newspaper. Many readers correctly guessed last column’s artifact, which is a miner’s carbide lamp that could be clipped onto his helmet. A quantity of the chemical calcium carbide was placed in the lower chamber, and water in the upper chamber. A controlled drip of water falling on the calcium carbide produced acetylene gas which could be ignited to produce light (and heat). A legend on top of the lamp reads “GUY’S DROPPER,” with a patent number. This time we have a simple artifact related somehow to something mentioned in the article. The color is not natural; it’s a bit rusty. What might this be? Additionally, does the fact that I keep picking mystery artifacts from my own magpie stash of junk treasures mean it’s time for a garage sale? Nah, there’s room for one or two more things, isn’t there? Thanks for reading! Laura Bien is a local history writer unskilled at canning. Reach her at ypsidixit@gmail.com. Some sort of ice thongs? I love reading the old newspapers (Argus and such) online. Those folks had it going on…they were all about who was sick, who was in town, who visited whom, births, deaths, parties, social events…it was Facebook but for the late 1890s. And I miss having a “paper” paper (no disrespect to my friends who write for the online version). My dad lives in FL half time and I love getting up and doing the crossword with him when we go and visit. OMG best. typo. ever!! I meant ice *tongs *. That typo should win some sort of award. Go, me! Patti: Tidbit: All of those social notes in the “Personal” columns were submitted by the participants. Before telephony, people would drop by the local newspaper office and drop off these tidbits about who was visiting at Whitmore Lake, who had a pedro party and what the decorations consisted of, who was treated to a surprise birthday party and what the gift was. People wanted those things in the paper and actively sought to have them included….because *everyone* read the paper; it was a shared experience. Regarding your guess: I had a brief mental image of my hero Roald Amundsen, part of whose polar success consisted of strategic streamlining of his equipment. Light sledges, I mean. That’s so cool and a bit like social media today. I know that we worry about not having privacy “these days” but it’s apparently been a thing for quite some time. I also like the old society columns that they had back in the day, too…how fun! It would be interesting to compare the old “Personals” columns with something like Twitter to find the differences between then and now. Some similarities, some differences. Yes, I think the Teach got it but it could also be a a pretty impressive navel piercing piece… or a marshmallow torture device… neither of which did I see mentioned in the article. ABC: Marshmallows were indeed not mentioned…interestingly, mass commercial production of them didn’t begin until well after WWII, when one Alex Doumak patented the “extrusion” method; previously, marshmallows had been made laboriously in molds. 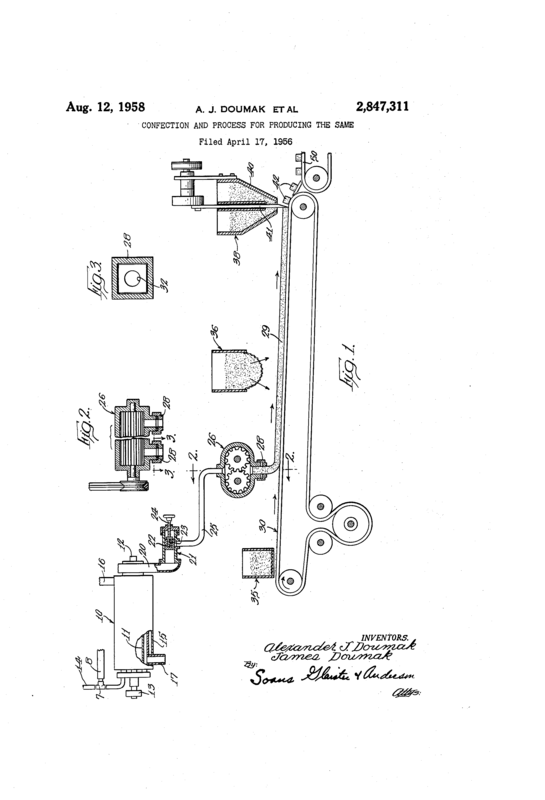 Doumak’s 1956 patent illustration for the extrusion process shows the little square candies rolling off a conveyor belt: [link] Numerous online sources say that the extrusion process was patented in 1948; not in the 1950s; I could find no evidence of this. The Doumak company still makes marshmallows today, just outside of Chicago. The popular “Campfire” brand is made by the Doumak company. I was going to guess that those tongs were used for placing jars in and removing them from the canning bath. So if not ice tongs, then canning tongs.